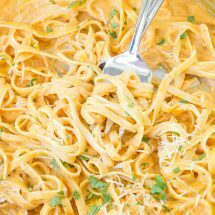 It’s velvety and smooth and rich and with less than a quarter of the cream and less butter than classic Alfredo sauce. 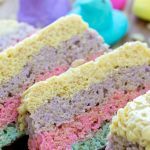 So not only does it taste amazing, but you won’t even miss the cream or butter! 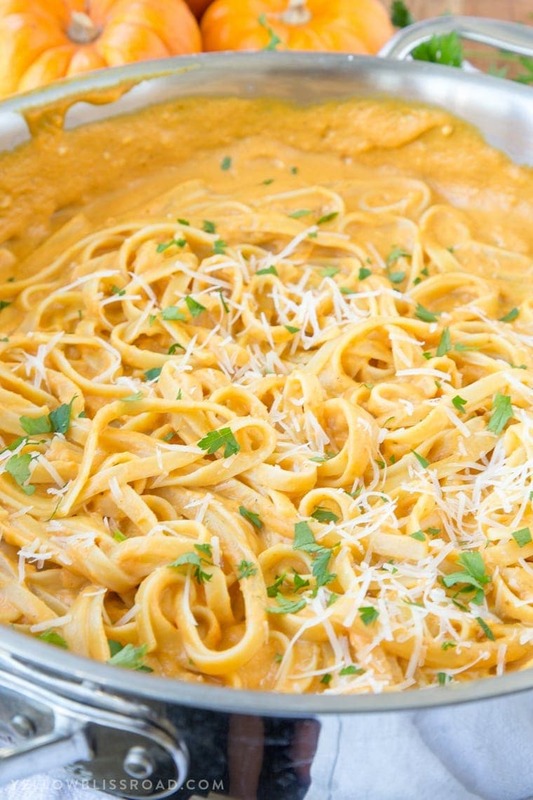 If you’re a fan of savory pumpkin recipes, you are going to LOVE this Pumpkin Alfredo! I am a huge fan of Alfredo, but I usually avoid it since it’s definitely an indulgence. The classic sauce calls for 2 cups of cream and a whole stick of butter (yikes!). 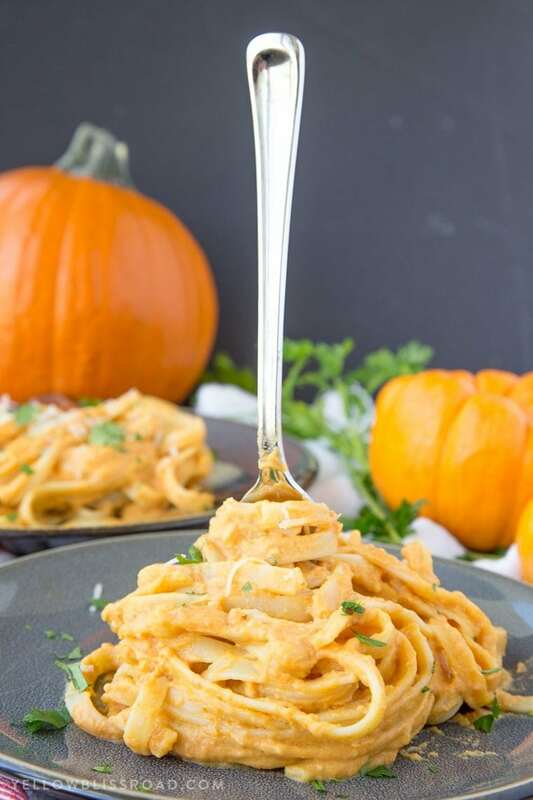 This Pumpkin Alfredo uses only two-thirds of a cup of half and half (half milk, half cream) and 6 tablespoons of butter. 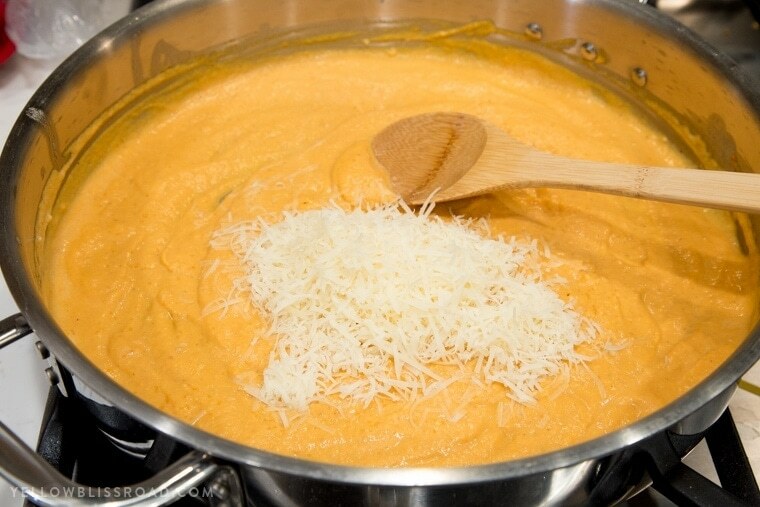 The addition of the pumpkin give a velvety smooth texture of the cream, without the fat and calories. 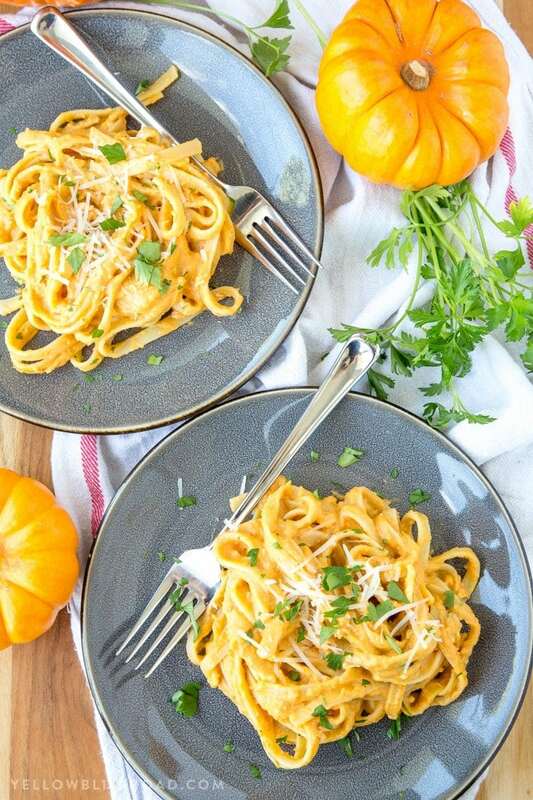 Since pumpkin has such a neutral taste it’s the perfect substitution, which is why I’m always on the hunt for new pumpkin recipes! 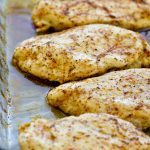 This dish makes about 4 servings and its perfect for company or just when you need an easy weeknight meal this fall. For all pasta recipes, go HERE, for all dinner recipes go HERE and for the Recipe Index go HERE. Hi 🙂 I’m just wondering what the ingredient ‘half and half’ is? Two kinds of cheese? It’s a dairy product that you can find with the heavy cream. Half & Half refers to a product that is half milk and half cream. 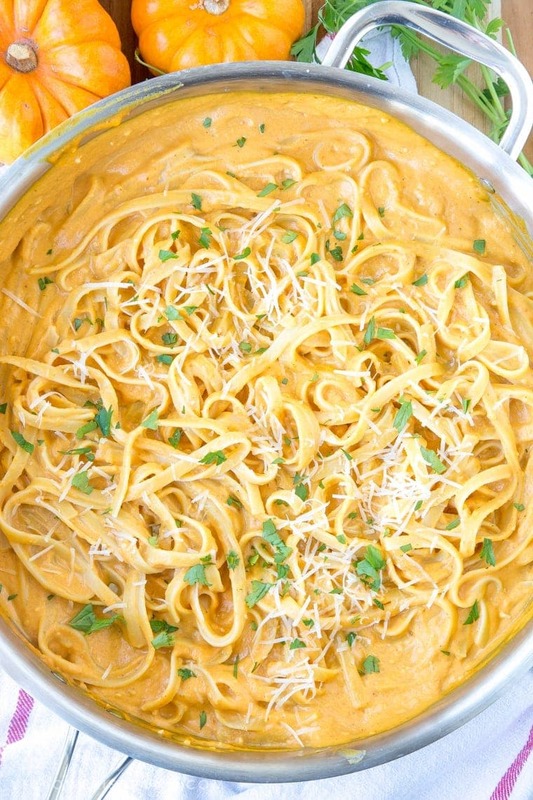 Creamy pumpkin alfredo is delicious! I used pumpkin pie Purée instead of regular pumpkin purée it gave it a sweet note! My family loved it! 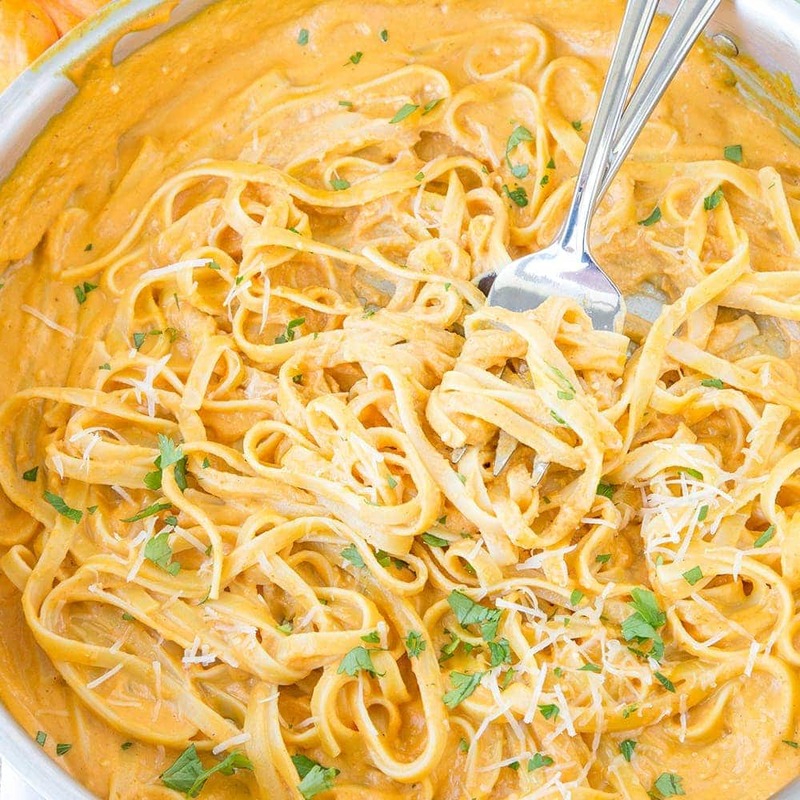 Creamy pumpkin Alfredo is delicious! I used pumpkin pie purée instead of regular pumpkin purée it gave it a sweet note to it! The family loved it! Great idea Elyse,Thanks for sharing your feedback. Great alternative, thanks for sharing. 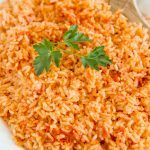 I used my own home processed pumpkin! Thanks for sharing! Do you think it would pair well with any other veggies if I were to put some in? Any thoughts on which ones? I think something on the sweeter side, like carrots, would work well. I am addicted to this stuff! 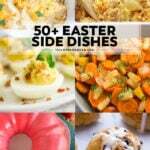 I have made it so many times I have the recipe memorized! 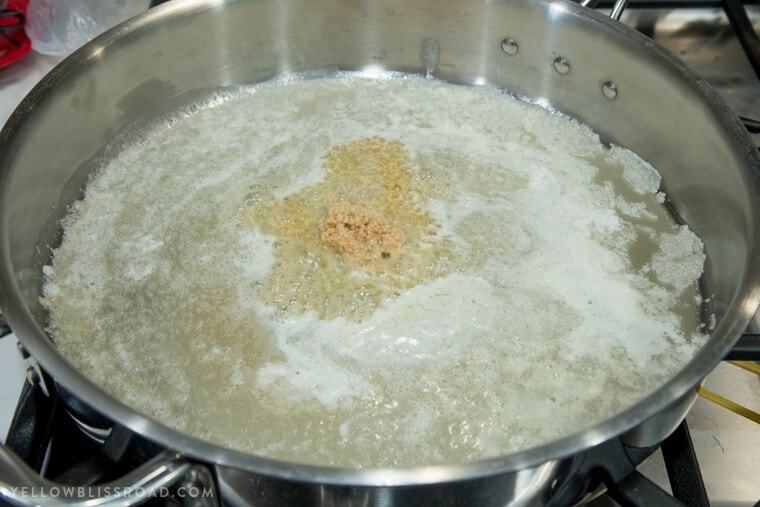 Only changes I make are to use milk instead of pasta water to thin it to desired consistency, and add in some white pepper, and a bit more nutmeg than it calls for (personal preference). I don’t bother mixing the pasta in the sauce, just divide into bowls regularly. 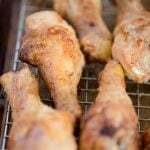 Love serving it with some grilled chicken! Thanks for your feedback, Kate! 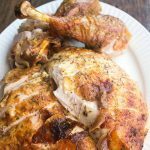 Love that you are loving this recipe! This was a little “pumpkin-y” for our taste the first night, but by the time I had the leftovers for lunch the next day the flavors had blended and the pumpkin was less overpowering. The recipe seems to need a bit more flavor – maybe a few more cloves of garlic and some sage. I couldn’t find anything that specifically said “pumpkin purée”… is it okay to just a can of “pure pumpkin”? Looks delicious I am trying it this week ! How much pumpkin does it need? What size can ? 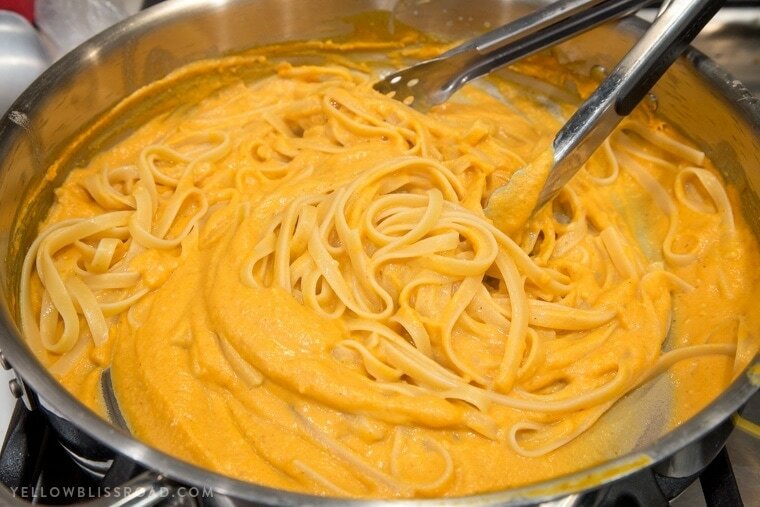 I might even try to make it with homemade pumpkin puree just wondering how much is needed. Thank you so much can’t wait to try it! The recipe calls for 1 cup of canned pumpkin. The smallest cans are usually 15 ounces so you would use some and then you could freeze the rest for use in another recipe. I made with Penne, increased the sauce by about 30% & finished in a baking dish w/ parm grated on top to make a crust (used more than 1/2 cup as to cover). Didn’t need long in oven and stayed creamy. 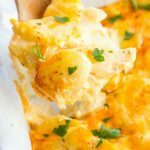 Perfect for a fall/Thanksgiving buffet! This was amazing! I made it exactly as directed. My husband grumbled when I told him what I was making but he loved it and went back for seconds. It’s a half milk/half cream combination. You can find it in the dairy section with the milk and creamers. Some winter veggies, like broccoli or Brussels sprouts would be great. Or add chicken and make it a complete meal just with the pasta! I never have cream or half & half on hand; would using 2/3 cup milk ruin the creaminess? The cheese you’re adding will help with that. I have personally used just milk for regular alfredo so I think you’ll be fine. You could always add a couple tablespoons of cream cheese if you happen to have that on hand. 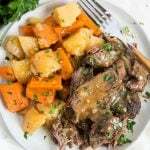 I would like to make this but i can’t find pumpkin puree anywhere, would a good pumpkin soup be ok to use? No you’d want to use the canned pumpkin. It’s usually available in the baking aisle with the pie making products. You just want to make sure it’s not pie filling. Can i use a good pumpkin soup to make this recipe as i can’t find pumpkin puree anywhere? We lived this recipe​! I increased the pumkin and Parmesan to make it a little heartier! Very tasty! How much cheese? Should it read 1/2 C? I would like to make this for a pot luck at work, but there is no stove there. So could I make the sauce for the pumpkin alfredo and keep it in a a crock pot on warm? And reheat cooked noodles in microwave. I like to bring healthy and yummy if I can and this looks and sounds so good. Hi Edythe, You could try it, but Alfredo sauce is cream based and really doesn’t reheat well. You could try making it and bringing extra cream to add as you reheat it…but it still might curdle. To Edythe about bringing it in the crock pot, I think mixing everything but the cream and adding that at work would be OK. Maybe heat it a little in the microwave or a little before serving. You can add some milk/water at work too. What do you think Kristin? I’m very cautious about pasta in the crockpot. I think it could work as a reheated dish and adding the cream and cheese later, but then it might not melt properly. I was wondering because it didnt specify if the pumpkins is puree cooked or purée raw? It’s the canned puree. You can find it in the baking aisle.